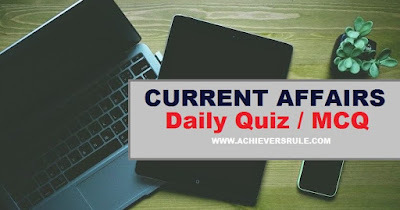 You must solve the Daily Current Affairs MCQ - 20th December 2017 and get ready to face the upcoming IBPS, SSC exams easily. The Current Affairs Set consists of the questions of latest pattern, answers along with explanations that covers all the latest news updates i.e. sports, awards etc. Q1.Name the country that would host a meeting with 40 WTO members regarding Food Security. Q2.The _____ Liberation Day of Goa was celebrated with great pomp & show in Panaji on December 19, 2017. Q3.Which of the following is celebrated as the Minorities Rights Day ? Q4.What is the rank of India on the Global Innovation Index (GII) 2017 ? Q5.Which state has approved a policy to offer transgenders in the state pensions, ration cards, plots for housing and financial aid to open businesses ? Q6.Eminent Bengali poet Joy Goswami will be given the 31st Moortidevi Award for the year 2017 for his work _____. Q7.BBC Sports Personality of the Year 2017 is awarded to Mo Farah. He is associated with which sports ? Q8.Who is awarded with the 2017 National Design Award ? Q9.India finishes 1st at junior boxing championship held in _____ . Q10.Aakarshi Kashyap is recently in news. She is associated with which sports ? Q11.Which country has overtaken Saudi Arabia for the first time to become India's top crude oil supplier in the current fiscal ? Explanation 1. Commerce and Industry Minister Suresh Prabhu said India will host a meeting of about 40 WTO members in February to muster support for food security and other issues. Explanation 2. The 56th Liberation Day of Goa was celebrated with great pomp & show in Panaji on December 19, 2017. Several programmes and events have been organised to mark the occasion. The state was liberated on this day in 1961 from Portuguese control after almost 450 years of colonial rule. The armed action “code name – Operation Vijay” was carried out by the Indian Armed Forces in December 1961. Explanation 3. Minorities Rights Day in India is celebrated on 20 December 2017. Minorities Rights Day in India is a very significant day in order to promote and preserve the rights of people belonging to linguistic, religion, castes and color minority. Explanation 4. India currently ranks 60th out of 127 countries on the Global Innovation Index (GII) 2017 as compared to 66th rank on GII 2016. The list is topped by Switzerland. Explanation 5. The Andhra Pradesh Cabinet approved a policy that would offer transgenders in the state pensions, ration cards, plots for housing and financial aid to open businesses. Under the policy, the government will provide Rs 1,500 a month to transgender people above 18 years of age as a social security pension. Explanation 6. Eminent Bengali poet Joy Goswami will be given the 31st Moortidevi Award for the year 2017. The committee, headed by poet and scholar Satya Vrat Shastri, unanimously decided to confer the award upon Goswami for his poetry collection titled Du Dondo Phowara Matro. Explanation 7. BBC Sports Personality of the Year 2017: World 10,000m champion Mo Farah wins. The 34-year-old, a four-time Olympic champion, won his third successive world 10,000m gold medal in London in August - despite almost falling twice late in the race. Explanation 8. G. Satheesh Reddy, Scientific Adviser to Raksha Mantri and Director General, Missiles and Strategic Systems, has been conferred with the prestigious National Design Award. Satheesh Reddy spearheads Dr APJ Abdul Kalam Missile Complex, 'the Missiles hub of India', steering the design and development of a wide variety of tactical and strategic missile systems. Explanation 9. India finishes 1st at junior boxing championship in Germany. The Indian junior boxing contingent finished at the top of the medal tally after the boxers clinched six gold, four silver, and one bronze medal at the fifth International Sven Lange Memorial Tournament in Germany. Boxer Bhavesh Kattamani, who won a gold in the 52kg category, was chosen as the tournament's best boxer. India was named the tournament's best team. Explanation 10. Aakarshi Kashyap wins titles in U-17 and U-19 categories in the Junior National Badminton Championships. Promising shuttler Aakarshi Kashyap lived up to her billing as she secured double crown at the 42nd Junior National Badminton Championships 2017 that concluded in Guwahati. Explanation 11. Iraq has overtaken Saudi Arabia for the first time to become Indias top crude oil supplier in the current fiscal, helped by sales of discounted heavy crude. Saudi Arabia traditionally has been Indias top oil source but in the April-October period of 2017-18, Iraq dethroned it, supplying 25.8 million tonnes (MT) of oil.